Last week I was invited to lead a branding discussion at a luncheon with members of the local chapter of SMPS, the Society for Marketing Professional Services. Amongst other questions, I was asked, “How can you improve your current brand?” It is a good question. Too often we think of re-branding, when in fact, more often, what’s needed is advancement of the brand you’ve got. I said, “Consistency will improve your brand”. Consistency is a design principle that dramatically affects usability and learning in all systems, including branding and identity. It helps us transfer knowledge to new contexts, focus attention, and learn more quickly. 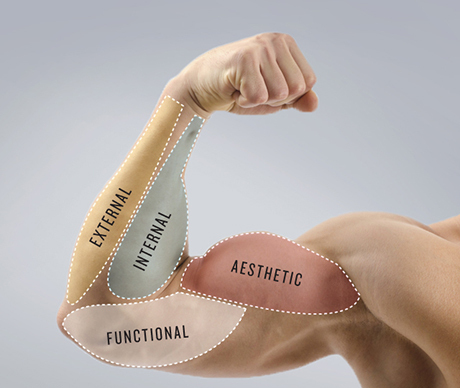 There are four types of consistency: aesthetic, functional, internal and external. Aesthetic consistency is the type most obvious in branding. A logo whose style and appearance is the same, no matter where it appears (color, typography, graphic), sets emotional expectations and becomes a shortcut to recognition and decision-making. For example, BMW vehicles are easily recognizable because the company consistently features the blue and white circular logo prominently on the hood (and in advertising, on dealer signs, in product literature, etc.). We associate the logo with the quality and prestige built into the brand and it informs people how they should feel: that it’s “The ultimate driving machine,” according to their tagline. Any parent can tell you how toddlers can “read” logos, long before they can actually read. I was once riding in the car with a young child of my friend’s, who not only recognized 7-Eleven signs, but even their consistent architecture. He cried when we didn’t stop at a repurposed 7-Eleven store, which was now clearly selling computers, but he easily recognized the distinctive building shape. Functional consistency refers to consistency of action and meaning. Humans require order, and functional consistency provides us with this order. Have you ever had a difficult time finding your way in a hospital? In the book Wayfinding the authors point out, “In a [hospital] facility of some 800 beds, no less than 8,000 hours of professional time are lost in redirecting patients and visitors to their destinations.” In the healthcare environment, investing in a wayfinding program is vital because, simply put, when people are lost, money is lost.” Functional consistency allows us to leverage existing knowledge about how the design functions. The symbols on my iPhone use the same controls for playing music that videocassette recorders used in the 70s. Such consistency makes the new devices easier to use and learn. Internal consistency refers to consistency with other elements in the system—your logo is the same online and in print, signs within a park are consistent with one another. Such internal harmony suggests that the system has been intentionally designed and builds trust with viewers. External consistency means having the same aesthetic design or performance across multiple systems. External consistency extends the benefits of internal consistency across multiple independent systems. This is difficult to achieve, but fast food companies do this very well. Even technology companies like Microsoft and Apple recognize that it works. You can go to these businesses anywhere in the world and expect to receive the same service, that they will be using the same equipment, and in the same amount of time you will receive the same product.